Protesters at last Saturday’s March for Science faced a continual downpour of rain when they gathered on the National Mall to protest President Donald Trump and his policies. This Saturday’s People’s Climate March may take place in record temperatures, as forecasters say the mercury could reach the 90-plus degree mark. Actor Leonardo DiCaprio, Virgin Airlines founder Richard Branson, and former vice president Al Gore are expected to attend, according to the Washington Post. The people backing the march range from the Communist Party USA, the Sierra Club, CODEPINK, and the Barack Obama-backed Organizing for Action. But the man funding many of the organizations listed on the march’s website as members of the steering committee have received millions of dollars from George Soros, the left-wing billionaire who has deep roots in the U.S. environmental movement and other liberal causes. “The ‘People’s Climate March,’ scheduled for the 100th day of Donald Trump’s presidency, claims to be a movement of the people. But is it really?” Newsbusters reported on Friday. 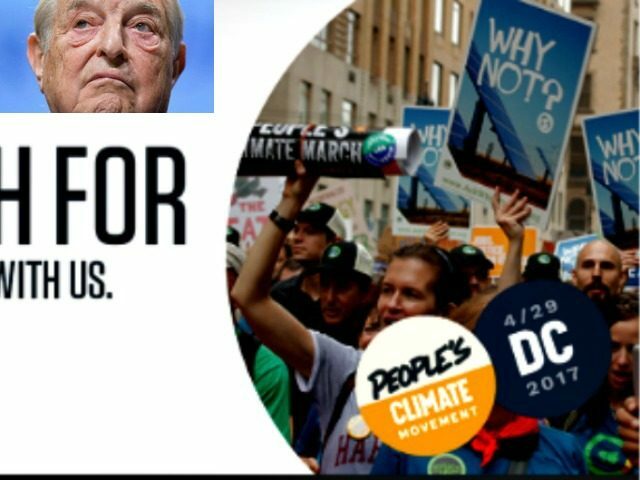 Newsbusters noted that only three of these six organizations — NRDC, Public Citizen and Union of Concerned Scientists — have climate as all or part of their mission, calling into question why so many non-climate focused groups are taking part in the march. “The presence of many non-climate related organizations leading the march indicated that this climate march (just like the March for Science and the Women’s March) is not about a single issue, but about attacking the new administration,” Newsbusters reported.